East Village's neighborhood tree inventory begins at 9 a.m. Saturday at Commercial Club Park, 1845 W. Rice St. Even if you can’t tell the difference between and oak and an apple tree, you can still help. East Village is now open for tax appeals through May 17. Join us at our Monday meeting at 7 p.m. to learn about the process and make an appeal that could lower your property taxes. The meeting is at the Happy Village, 1059 N. Wolcott. The tree survey and community gardens are also on the agenda. The proposed Field of Hope at Wells Community High School would include a baseball field that would double as a soccer field, small children's park, dog park and climbing wall with an outdoor movie screen on the opposite side. Principal Ernesto Matias gave a presentation at our April 4 meeting. West Chicago Township is now open for tax appeals with the Cook County Board of Review through May 17. Neighborhoods that are included in West Chicago Township would be East Village, Bucktown, Wicker Park and Ukrainian Village. You can challenge your tax assessment every year, not just after a reassessment, but there is only a 30-day annual window for appeals through the Board of Review. Join us at our May 2 meeting at 7 p.m. to learn about the appeal process. Aaron Bilton, Board of Appeals Commissioner Michael Cabonargi's chief of staff, will assist with assessment appeals. The meeting is at the Happy Village, 1059 N. Wolcott. On May 4, Cabonargi's outreach staffers present a property tax seminar at 6 p.m. at Holstein Park, 2200 N. Oakley Ave. They'll explain the process and help homeowners complete appeal forms. Attendees are asked to bring their tax bills to help file appeals. Property owners who cannot attend the meeting can download the form from the Board of Review website. Ald. Scott Waguespack says his office at 2657 N. Clybourn Ave. will collect forms until May 16 to turn into the Board of Review. East Village has about 12,000 residents, and three aldermen. Will yours change in this year's ward remap? The City Council redraws boundaries every decade, after the U.S. Census Bureau publishes block-by-block population and racial profiles. The 2010 data released Feb. 15 counted about 2.7 million people to divide among 50 city wards. In theory, wards are equal in population, which would work out to 54,000 residents each. Wards also should be compact, not sprawling, and should encourage minority voices in City Hall. But these two goals can work at cross purposes, particularly as aldermen try to strengthen their own voices in City Council chambers. Voting trends shape the ward alignments as surely as census trends. So every redistricting brings new zigzag boundaries. The 2001 map puts East Village in the 1st, 27th and 32nd wards. A spoon-shaped stretch of the 32nd Ward dips south from Bucktown between Hoyne and Leavitt, surrounded by 1st Ward turf in Ukrainian Village and East Village. The 27th Ward stretches west from Wells Street to all but three East Village blocks east of Ashland Avenue. There are reasons to think East Village will not get carved up next time. First, incumbents are less likely to continue business as usual. Proco Joe Moreno in the 1st Ward and Scott Waguespack in the 32nd both campaigned to make government more efficient, and worked together to streamline Streets and Sanitation tasks. Waste haulers in the two wards now pick up trash on each other's turf where routes overlapped. Both aldermen say they're interested in a more straightforward division of the two wards. Changes have been dramatic in all three sectors: Hispanics were in the majority from Ashland to Damen until 2000. Yet the three East Village tracts remain more diverse than most adjoining blocks, and voting-rights laws would discourage changes that take away minority representation. The neighborhood might fit comfortably within a single Hispanic-leaning West Town ward, but Walter Burnett Jr. in the 27th Ward may still have an claim on the community's east edge. The date for a new map is uncertain: Mayor-elect Rahm Emanuel could ask for a census recount, since Chicago lost 200,000 residents in the 2010 survey and stands to get less federal money as a result. State legislative districts will change as well, with maps likely to emerge in another month for the 2012 General Assembly election. City voters won't choose aldermen again till 2013. There's no consensus that one East Village alderman would be a good idea. East Village Association directors discussed the remap prospects April 11 and quickly decided there wasn't much they could do to affect the outcome. A single alderman would make neighborhood planning simpler: Tracking down three aldermen can be difficult for a small group of volunteers with a broad development vision. Getting all three to see things their way can be harder still. But sometimes three's a charm. Board member Aaron Bilton, who lobbied the city for a public library as EVA president, thinks having the a trio of aldermen in his corner helped clinch the new, larger West Town branch. The library opened last year at Chicago and Ashland avenues, a ward dividing line. 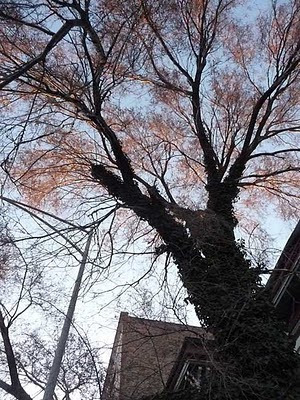 East Village's neighborhood tree inventory begins at 9 a.m. April 30 at Commercial Club Park, 1845 W. Rice St. Even if you can’t tell the difference between and oak and an apple tree, you can still help. 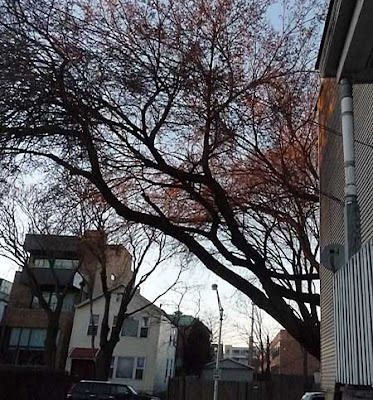 The East Village Association in partnership with Natural Path Urban Forestry Consultants will be conducting Chicago’s most complete tree inventory. Mark Duntemann, the principal of Natural Path Urban Forestry Consultants and a world-renowned arborist, will train volunteers to conduct our tree inventory. We encourage volunteers to join us in completing our neighborhood-wide tree inventory. Dress appropriately as will obviously be outside and we will be walking the entire neighborhood. We will be collecting species, diameter, condition and maintenance needs for each tree. Additionally, we will be identifying all vacant planting spaces. The inventory will provide the Chicago Department of Forestry with a list of immediate risk reduction recommendations to include removals, pruning and cabling to brace failing trees. Our inventory will provide the basis for developing a planting strategy for the East Village. This will include strategies for our major streets such as Augusta Boulevard, Chicago Avenue and Division Street. An environmental benefits analysis will be done with the data collected using the United States Forest Service application I-Tree Streets. Outputs include oxygen created, carbon dioxide used, storm water uptake and pollutant particulate uptake. The East Village will be the first Chicago community to conduct a neighborhood-wide inventory of this scope. Every tree counts toward a greener, healthier, more beautiful East Village. Trees give us many benefits, from cleaner air and cooler summer temperatures to higher property values. Your volunteer efforts on April 30 will benefit the East Village for decades to come. Jeanne Felknor tends a parkway on Winchester Avenue at Thomas Street. Board Members: Greg Nagel, Neal McKnight, KK Goh, Dana Palmer, Tom Tomek, Aaron Bilton, Scott Rappe and Stephen Rynkiewicz; Non-Board Members: Rich Anselmo and Paula Tomek. Meeting commenced: 6:34 p.m.
Paula and Tom Tomek presented their draft designs for signs to indicate the East Village neighborhood. Those present expressed opinions on designs and what the signs should include. Scott Rappe reported on his meeting with Ald. Proco Joe Moreno regarding the Roots project at 1924 W. Chicago Ave. The concessions put in writing are to close the pickup window by 8 p.m. or dusk. Rappe said he put in a suggestion to just say 8 p.m. Another concession was that delivery cars will be marked and will not use the pickup window, and that valet will be on Chicago not Winchester. Rappe will try to get the alderman to sign the final written concessions so that they will hold more weight should issues arise. Governor's Pawn Shop (former gubernatorial candidate Scott Lee Cohen proprietor) has been proposed at 1227 N. Milwaukee on the Polish Triangle, and the Wicker Park Bucktown Chamber of Commerce has asked for EVA's opinion on zoning. The EVA board was not in favor of a change from B3 to B1 and a zoning special use. A CVS Pharmacy request to sell liquor at 1200 N. Ashland Ave. would require the city to lift the liquor moratorium for a two-block area. EVA board voted against lifting the moratorium. Ald. Moreno expressed frustration about EVA's failure to approve bank development proposals for the former Pizza Hut site at 1601 W. Division. According to Neal McKnight, the alderman's office receives calls frequently about making that site more appealing as well as frustration as to why development has been turned away. The EVA board believes this site should preserve the pedestrian designation of Division Street. McKnight will speak with the bank owning the Pizza Hut property about possible solutions. Greg Nagel will speak with Yum Brands about altering its covenant against food being sold on that site so that a greater array of development can be considered. Guest speakers May 2 are arborist Mark Duntemann regarding the April 30 tree census and Jeanne Felknor of the East Village Garden Club on gardening. McKnight will send a reminder to both guest speakers about presenting. Aaron Bilton also will bring forms for appealing property taxes. Owner Eddie Radwan came to the board meeting along with two neighbors with Krain Corp. realty asking for the liquor moratorium to be lifted so that Radwan can sell liquor at 1001 N. Damen Ave. He expressed this as his way to compete with the gas station across the street. Radwan also presented a new concept to sell fresh fruits and vegetables and add a deli counter. The board voted against lifting the moratorium but Greg Nagel will encourage the owner to go forward with the fresh food and deli counter. Stephen Rynkiewicz agreed to write an article for the newsletter about Wells High School at 936 N. Ashland Ave. and how people in the neighborhood can help out. Greg Nagel will reach out to Wells and offer raffle assistance for fund-raising events. He will also ask if students would like to participate in the tree survey April 30. Dana Palmer will e-mail the alderman's office regarding obtaining receptacles for bags that can be placed throughout the neighborhood to help reduce waste. McKnight will reach out to Ronda Locke for students to participate in the tree survey. He will also get the time and location to meet April 30 from Mark Duntemann. Rappe will inquire about possibility for T-shirts. Rynkeiwicz will send an email blast about the survey. Scott Rappe will ask Real Naked Food, 1909 W. Division St., to present the May 2 business minute. Tom Tomek will ask new commander Frank Gross with the Wood Street police station to make a June 6 presentation. Rappe will ask A.N. Pritzker Elementary School principal Joenile Albert-Reese to present in July. Rappe will call in June to check on status for our neighborhood. 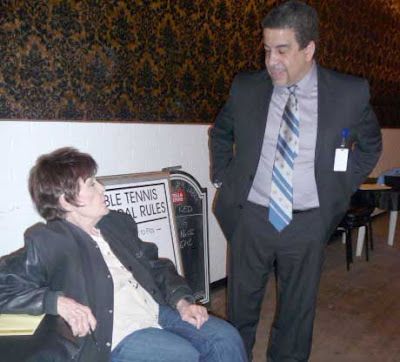 Wells principal Ernesto Matias talks with Carol Mrowka before the meeting at Happy Village, 1059 N. Wolcott. Meeting commenced at 7:06 p.m. Rob Levitt, owner of The Butcher & Larder, spoke about his store, opened at 1026 N. Milwaukee two months ago. It is open every day of the week except Tuesdays. Levitt's focus is on working with small, local farms to obtain meat and use the whole animal with no waste. Ernesto Matias has been principal of Wells Community Academy High School for three years now. He told some of the history of Wells and stated that there are now 582 students with a 60% graduation rate. Matias described the three academies at Wells for logistics, law and teaching, and how he and his staff plan improvements. If awarded, a grant would give $2 million a year for three years to coach teachers. A swimming pool to open in June 2012 possibly would be open to the public before school hours. The proposed Field of Hope would include a baseball field that would double as a soccer field, a small children's park, dog park and climbing wall with an outdoor movie screen on the opposite side. EVA and the surrounding neighborhood could help Wells by mentoring, tutoring, being a guest speaker or motivational speaker, parent patrol and assisting with grant writing. Fundraising is another way the community and EVA could provide support, Matias said. A motion was made by Stephen Rynkiewicz and seconded by Neal McKnight to make a change to the bylaws regarding who is eligible to vote. The motion was to delete preamble of Article IV; delete last two sentences of Article IV Section 2 of the bylaws; Amend first sentence of Article IV to read: “Only members in good standing over 16 years of age who reside or own property in the area defined in Article II and who have been members for a minimum of three months are eligible to vote. Add at end of section: “No person may cast more than one vote.” Motion was passed with only one vote in opposition. The tree census is set for April 30. KK Goh as new EVA treasurer stated that current funds are just over $3,000. Aaron Bilton reported that Andersen school is closing early and existing students will be given an opportunity to enroll at LaSalle II. The West Township Board of Review will close May 17. Aaron Bilton will bring forms to appeal property taxes at the next membership meeting. 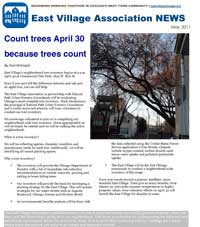 EVA will seek teenage and adult volunteers to canvass trees throughout East Village on April 30. Vice president Neal McKnight said the Arbor Day weekend census will help city forestry staff find ideal locations and varieties for new parkway plantings. Find out more from McKnight at neal@mkmplaw.com or attend Monday’s 7 p.m. EVA meeting at the Happy Village, 1059 N. Wolcott. 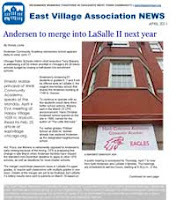 Paid members of EVA can download the East Village Association newsletter for April at OhSoWe.com. There's news of Andersen school's merger into LaSalle II, a meeting with the 1st Ward alderman, and a call for volunteers to size up the trees of East Village. Don't forget to attend Monday's meeting at Happy Village, 1059 N. Wolcott. The principal at Wells High will speak starting at 7 p.m.